A mighty mazel tov to Seattle restaurateur Susan Kaufman, named 2010 Nellie Cashman Business Owner of the Year. Kaufman owns and operates two Eastlake restaurants, Serafina (open since 1991), and Cicchetti (which made its debut in 2009). As one of five finalists — a list that included Cupcake Royale’s Jody Hall — Kaufman was feted at a gala event October 14. “I was, and am ferklempt,” she said this weekend via e-mail of her emotional state, describing both the thrill and her surprise, at the win. That win comes courtesy of Women Business Owners, a Puget Sound professional organization that annually recognizes and honors women entrepreneurs, bestowed in the name of Nellie Cashman — an American pioneer, gold prospector, philanthropist and entrepreneur. 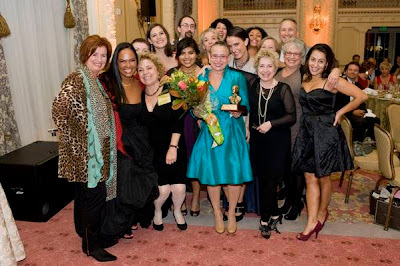 Susan Kaufman (in blue) does Nellie proud at the 2010 Nellie Cashman awards.